Heritage for Peace, within the framework of the international co-operation established under the auspices of UNESCO Observatory for the Safeguarding of Syria’s Cultural Heritage, invites archaeologists who prior to 2011 were directing archaeological research projects in Syria, to participate in a brief survey. The survey consists of 10 questions. The aim of the survey is to make a constructive contribution towards rehabilitating Syria’s cultural heritage sites by gathering information about the known status of archaeological sites. This photo was released on 21 June of the damage around Aleppo Citadel by Wereng Freesy (with thanks to Alisar Iram for cross-posting it). With the recent change in situation in Homs, the DGAM have conducted a number of assessment missions. The details below are approximate translations from the Arabic articles on their website (with thanks to the translators). Khan Al Jamal: used as a plant nursery outside the old city. Khan AL Droubi: Located at the end of Abd Hamid Droubi Street outside the old city, it was used by several activities including: Historical Society, The Scout in Homs, and some commercial shops. Raghadan Palace: It was a commercial building, and currently a hotel, located at the intersection of Qwatly street with King Faisal Street at Martyrs’ Square. Al Farah café: An architectural block Located at Qwatly street outside the old city. The full article is available in English here, and Arabic here. In addition, the Minister of Culture and Dr AbdulKarim, the General-Director of the DGAM, together with technicians, visited monuments in Homs in order to determine the status of the sites and initiative conservation and stabilisation procedures. The list of sites they visited can be found in the full article on the DGAM website, here. 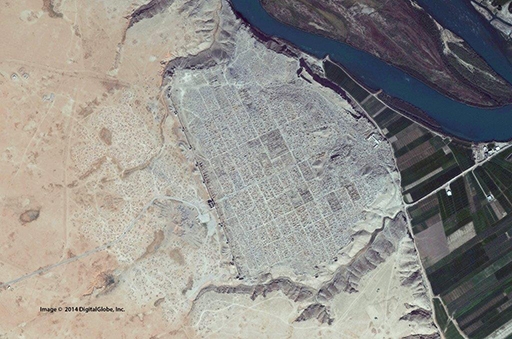 The DGAM have released ‘before and after’ satellite imagery of the damage sustained to the Tentative World Heritage sites of Dura Europos, and Mari, and to Tell Sheikh Hamad. All sites were known to have been looted during the conflict to varying extents. The article can be read here in English, and here in Arabic. An additional article was released in conjunction with this by the American Bureau of Educational and Cultural Affairs here, where the satellite images can be viewed in high resolution. Video of the storage of ammunition in Palmyra, near the castle, available here. Minor damage has been sustained by Muzayrib Castle caused by clashes, digging inside the castle, and use of the courtyard and galleries as a stable. Photos and hte report are available here in English and here in Arabic. The historic Muzayrib Mill in the western countryside of Daraa was damaged. Photos and the report are available on the DGAM website here. 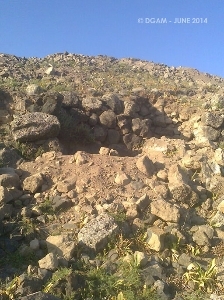 (Alternate transliterations of the site name are Mzairib, and Muzeireeb Castle / Mill). The Ottoman Mosque, Bab al-Nasr, has been damaged – To view the YouTube video, click here. 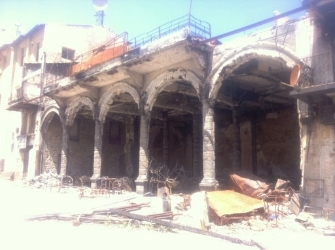 The Saddek Mosque in Aleppo has been extensively damaged. 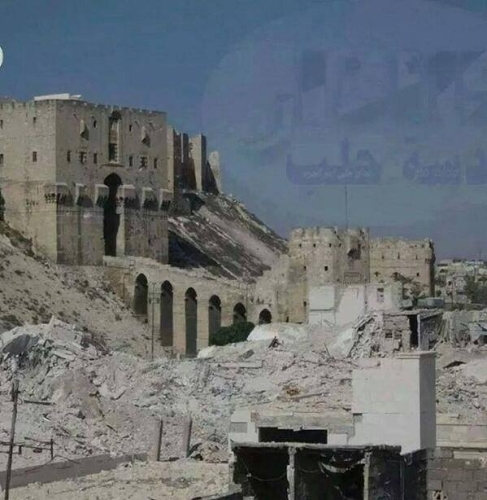 Two photos of the damage were shared by the Facebook group Aleppo Archaeology here and here. The minaret of the al-Rumi Mosque in Aleppo was damaged by shelling. A photo was shared by Lens Syrian Revolution here. The facade of the Ottoman Police station in Bosra al-Harir has been damaged. the full article and photo is here in English, and here in Arabic. The DGAM have recently conducted a site visit to Tell Ashaari in the western countryside of Daraa, and taken photographs of the looting. According to the DGAM, another 10 funerary reliefs from Palymra, all again dating from to the 2nd and 3rd centuries, have been seized. Read the full article in English here, and in Arabic here. The DGAM would like it to be known that they are not associated with the new Facebook page claiming to be by the DGAM’s director. This page is not official. (See details here). 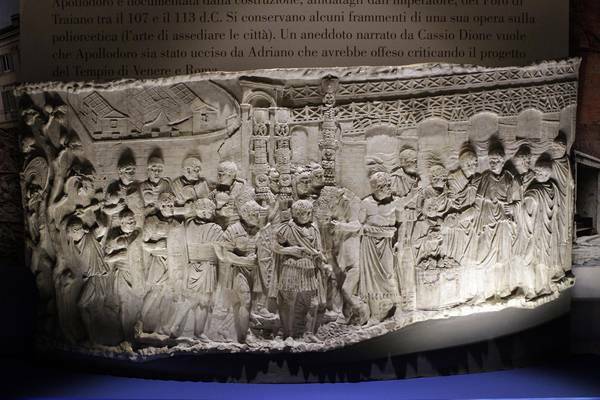 The “Syria Splendor and Drama” Exhibition has opened in Rome. The goal is to raise public awareness about the value of the Syrian Cultural Heritage and the importance of its protection. It is part of the new Italian initiative reported a few weeks ago. Read the ANSAmed press released on the exhibition here, or join the Facebook group here. A German version of the Red List was launched on 12 June 2014. The press release is available here. A symposium was held in Tokyo entitled “Toward the Protection of Syria’s Cultural Heritage”, on 23 June 2014. The poster for the symposium is available here: it was shared by the Facebook group Aleppo Archaeology. Rainer Schreg has released a new update on his blog – Archaeologik – on damage to Syria’s heritage (in German), Threats of cultural heritage in Syria (June 2014), available here. Iraq conflict menaces heritage sites, in The Wall Street Journal (subscription only), 27 June 2014. Fear, concern and propaganda are spreading false information about destruction of cultural heritage in Iraq, Conflict Antiquities Blog. The destruction of the historical heritage of Syria, Mundi hurbila blog, 03 June 2014. Idlib Syria’s Cultural Heritage, in ARANews, shared 19 June (Arabic with English subtitles). An Arabic article on the protection of Syria’s heritage, available here.